Debian Installer component for restricted networksDebian Installer component for restricted networks. 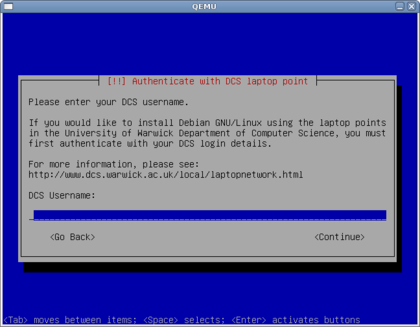 Like most public wifi access points, the University of Warwick Department of Computer Science requires all wired clients to authenticate against a HTTP Basic page over SSL before any "useful" network connection can occur, which makes installation of Debian impossible. warwick-dcs-laptop is released under the GNU General Public license version 3 or later.